"The decision to relocate the church was the biggest challenge by far." Evidently the answer to the question was God wanted the church to assume a multi-million dollar debt. Evidently God did not want to save the dozens of people who live within walking distance of First Baptist Church. Evidently the "decision to relocate" was easier than the "decision to win souls." Softball for Jesus seems to have a higher priority than saving lost people from going to Hell. Did the staff of FBC Alamo already win every soul in town to the Lord? Is that why God allegedly led them "to relocate the church" outside the city limits? How many lost people live within walking distance of the church now? As a Sunday School teacher, how many people have you personally brought to the Lord in the past six months? As a church staff member, how many homes did you visit within walking distance of the church building you just left? Did you disciple them into First Baptist? Did you ever visit them at all? 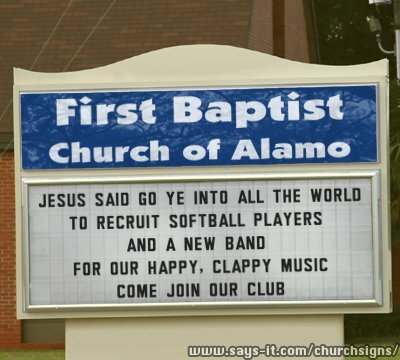 Is softball really more important than introducing lost people to Jesus? Southern Baptists have the fewest baptisms since the 1950s and are losing members. It's time to build a new building to celebrate our total refusal to win souls to Christ. 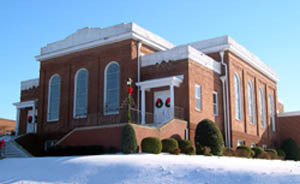 First Baptist averages ONE HUNDRED FEWER MEMBERS on Sunday morning than they averaged thirty years ago. So we need a new church sign descriptive of what is happening. 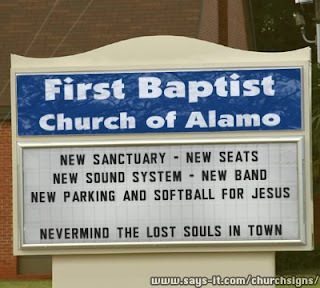 Since the newspaper is so excited to print publicity shots for the abandonment of the historic building on the most strategic corner in the county, let's see how the church sign will look for the first few Sundays of the grand abandonment of the city of Alamo. Let those lost people fend for themselves. We have a new building, new seats, new P.A. system, new band, new parking lots, new softball fields and plenty of space to grow to 200 on Sunday. Amazingly First Baptist Church used to have well over 300 people every Sunday with less room and few complaints. But if you are not going to reach people for the Lord and win new souls to Christ, at least you can have new carpet and new seats and a new lighting system. Busy-work always gives the illusion that God if moving, when it's really nothing more than a few tractors moving dirt and a few guys playing softball for Jesus. So it looks like the lost people in Alamo who do not attend church anywhere will never be asked to attend First Baptist Church. At this point, has anyone even tried to lead a single person to the Lord who lives within walking distance of the church building? I don't think so, but I could be wrong. While there are far more Southern Baptist churches now than in the 1950s and 1960s, observers say baptisms have essentially plateaued since 1950. In 2010 there was one baptism for every 48 members of a Southern Baptist church. Sixty years ago the ratio was 1:19. In other words, it takes FORTY-EIGHT members of First Baptist Alamo to win ONE person to Christ. It takes 48 people to win one soul from hell?? Does NOBODY ever witness anymore? Do no church member or staff member EVER try to lead anyone to eternal life in Jesus? Who are you kidding? And you think you need a new building? In order for First Baptist to thrive as the living body of Christ, we need a lot less consumers and more co-laborers, people who are sharing the love of Christ with their neighbors, people who lead other people to Christ. Whatever you are doing now is killing the church. There are actually more new churches and fewer members overall. So instead of winning lost people to Christ, good ole First Baptist will finally become the newest country-club on the highway. When you can't win souls to Christ, when you REFUSE to win souls to Christ, you just build a new building. Churches everywhere are doing it. Let the local folks just go to hell. We have a new club house and a huge debt to pay-off down at the bank. Isn't this great news. First Baptist Alamo has 279 in Sunday School...in May, 1975. Same buildings, plenty of room for classes. Smaller parking lot, plenty of parking space. May 2010, 179 in Sunday School. Thirty-five years later, same buildings, one-hundred fewer people. "We need more space!" Let's go into debt (un-scriptural) and build softball fields for Jesus for 100 fewer people. Let's leave the crossroads of the county, Hwy 88 and Hwy 54, and move to the country. Lets forget about our un-churched Alamo neighbors and rip out members from other churches. We practice that long-time Baptist pattern that it is easier to give money than to personally become involved in the lives of others. We demonstrate that it is easier to give money than to personally win people to the Lord one-on-one. It is easier to build a building than to win souls. Let our historic church property deteriorate so we can sell it to some other sucker...er...to some other church and let them take care of the problems that we purposely neglected in the name of Jesus. Glory to God! Softball for Jesus beats soul-winning any day. Going into debt $$$ beats personal evangelism any day! "Whatever debt you go into, go into debt in the name of the Lord Jesus." "Whatever classroom ceiling you allow to deteriorate, allow it to deteriorate in the name of the Lord Jesus." Ten thousand dollars each month. With the average of 175 people in church every week, each person in church would be required to donate $57.15 per month just to service that debt. Every baby in the nursery would have to give $57.15 a month. Every seventh grader and fifth grader would need to give $57.15 a month to service that debt. A family of four would need to give $228+ each month just to service the debt. Then you still have to give regular donations to keep the doors open. And last I heard, the stained glass windows are not even going to be moved. Those are the windows paid for by the founding families of the church, the families and individuals whose names are on the windows. 1) People who have NO MONEY voted FOR the new building! 2) Young people who have NO MONEY voted FOR a $10,000/month debt!. 3) People who have NEVER REACHED EVEN ONE SOUL FOR CHRIST voted FOR the building. Let, me ask you a question. Will a modernist "auditorium" that feels and looks more like a sports arena than a place of worship reach lost people in Alamo? Will softball fields and video screens help reach those people in Alamo who now live close to the church but do not attend? What has happened to a traditional sense of place (in terms of church buildings) in the Southern Baptist Convention that has characterized the South? Why has building replaced soul winning? Why has "new and improved" replaced preservation and conservation of our heritage? This constant treadmill of building new buildings with all the fund raising and dislocation that goes with it is hardly conducive of a settled sense of continuity that develops a spiritual community. This entire enterprise has been a fiasco. Yes, I understand that church buildings are only tools. But when the current "tools" sit half empty on any given Sunday morning, what makes you think that moving the building out of town will reach more lost people in town, as was once stated as the purpose, to reach lost people? If the church buildings are only tools, why aren't you using the tools you have now? Like I said in an earlier post, if you aren't reaching lost people now, you certainly will not reach lost people when you move. Sure, you will draw some families from other churches (People are always drawn to new paint), but that is not evangelism!! There is much to be gained to see and feel the presence of one’s parents and their parents in the same place in which one is baptized, sings in the choir, stands before the altar in marriage, sits in the pew for weekly services. There is much to be lost as one sits in a building with no links to the past. That is especially true of modern buildings that were designed to be austere, arid, depersonalized, detached, and ahistorical. Even though I am not currently a member of FBC Alamo, that does not mean that we cannot see things going on that should be addressed. Ideas and observations have power. The discussion of ideas produces a sifting process in which the truth can emerge. That is why forums such as this are incredibly valuable. I would hope others can read these posts and discuss what is happening at FBC Alamo. 2) Virtually no lost people are actually being reached for Christ. 3) Moving the church will put the congregation in a terrible debt. 4) Ministry that is non-existent today will be non-existent after the move. 5) Every person attending church will need to pay $57.15 per month just to pay down the debt. With truths such as that, who has time to reach lost people? What is happening in your life? What is happening in the life of those who live across the street from the church? What is happening in the life of those who live within two blocks of the church building? Do you know who lives within a block of First Baptist Church? Are those local citizens in your Sunday School Class on Sunday morning? If not, where are they at that time? Why aren't they at FBC? Who visits the sick folks in town during the week? Who gives comfort to a family when someone is dying in the hospital? My Dad was a member of First Baptist Church for around sixty years. However, when my Dad was dying, there was not a church member or church leader in sight, nor had there been for several days! Do you think THAT is ministry? Do you call that representing Jesus? Is softball still more important to you than actually knocking on doors and inviting lost people to church? Do you ask for real ministry from the leadership or are you satisfied with the status quo? What about plans for the future? The "new club-house" building program was put on hold because God forgot to tell the congregation and the church leaders about His planned mini-recession for the economy. So what's gonna happen in Alamo now? First Baptist has been a nice, little neighborhood club for many years, a little religious club with weekly activities and a stagnant membership. How long will it remain a club, for members only, making very little, if any, impact on Alamo or Crockett County? When will First Baptist actually reach out to the individuals in the local community, one on one? When will First Baptist move from an idle, fruitless "we all together should..." style of ministry programs to a powerful, effectual "I, personally, will..." style of individual ministry? To have an impact on the community, it must happen. To have a positive, active spiritual influence on Alamo, members of First Baptist must each convert from the passive "we" idea to the active "I" idea of actually talking to individuals, one on one, and reaching them personally. When you personally reach individuals, then the community receives the results. First Baptist can remain just another, basically ineffective church, just another one of several in the community, as it has been for so many years. Or the individual church members can demand active ministry, positive, people-reaching ministry, life-changing ministry to individuals in Alamo. Will First Baptist remain just another religious club, coasting along, serving up the status quo week after week? Or will each individual church member become genuinely involved in reaching an individual in Alamo, personally impacting the life of a citizen of Alamo, acting out the great commission of Jesus...one on one? Yes, it seems to be true. God has been speaking to Christians, telling them to go into debt (never mind the Bible) and build new buildings. It is happening all over the country. One church had drawings prominently displayed on the wall. They also had a scale model of the new Christian retirement center God already told them to build. The economy got bad and suddenly God changed his mind. So they moved the church five miles away instead, abandoning the drawings, abandoning the property and abandoning the people who live there. WHAT??? What happened to God speaking? Did God change his mind? Is God so fickle that he doesn't know what he wants? God told another church to go into ELEVEN MILLION DOLLARS of debt to build a new building. Today, three years after the building was finished, they still owe several million bucks on that fiasco and the new pastor is trying to convince the deacons that they need a NEW sanctuary to reach new people. Isn't it amazing (and convenient) that "God's will" usually follows the economy. It's a miracle and it saved our reputation as representatives of Christ. And so, with no evangelism to speak of, resulting in stagnant church membership, and no professional people in the church (with big bucks), and in a depressed economy, isn't it convenient that God has personally "put a hold" on the new building. I wonder to whom God spoke first about waiting? Did God tell one of the deacons or the pastor first? Or did God tell one of the little old ladies that perhaps we should wait awhile? Often we hear that God speaks through circumstances. When we say that, what we really mean is, we will "go with the flow" but we use spiritual sounding platitudes to rationalize our decision and make it sound like we are actually HEARING FROM GOD. Again, how convenient. People say, "We missed God's timing" or something just as evasive, and phony. How can you claim to hear God speak so clearly about going into millions of dollars of debt, then claim to "miss God's timing" when the plans fall apart? Someone is lying. Either "you" or God. Or perhaps God just can't make up his mind. I need to visit and talk again to those folks who told me they had prayed about building a new church building and it WAS, without a doubt, God's will. I want to ask them what God told them about the multi-year delay in his plan from the time he originally told them personally it was "God's will" to move from a historic and prime location out to the edge of town, away from the very people to whom the congregation is allegedly trying to minister. How convenient this recession really is. Perhaps now the church folk can actually DO the work of the church, the work of actually making disciples and teaching them to make more disciples...to reproduce. Then maybe one day, in the future, there might actually be a need for more room.